At 3 Amigos the customer has the ability to receive a quality meal prepared in front of them in a matter of minutes, giving them the option of customizing their meal. Serving breakfast and lunch all day, everyday! 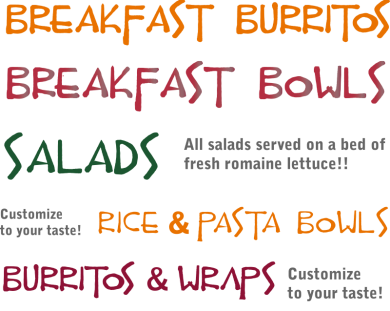 Menu items include gourmet quality burritos, bowls, wraps, salads, quesadillas, tacos, pastas, and nachos!